This question becomes more poignant when applied to the realm of rugs. The ‘Design Revolution’ is now a well-established phenomenon and it’s about to go full circle. Traditional oriental carpets have been (literally) stripped of their authenticity in a quest to create the neutral fabric needed to complement our interiors. 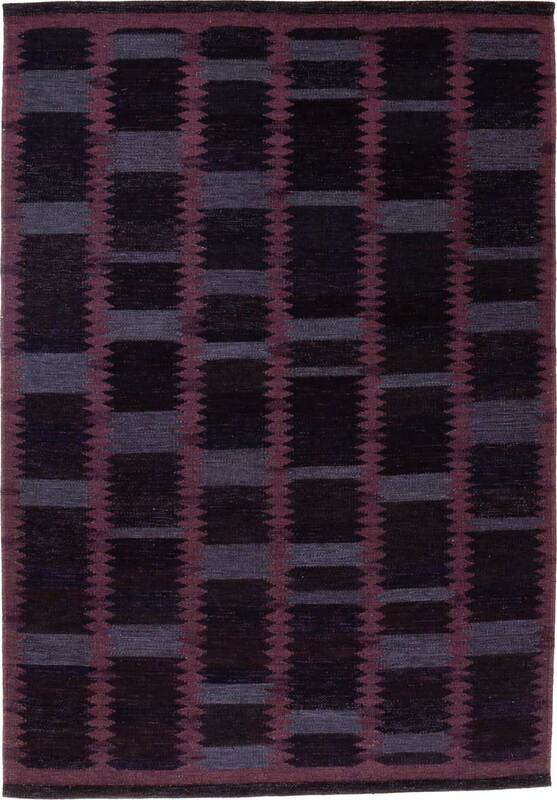 Overtly ‘ethnic’ weavings are instantly overdyed in unpredictable colours. Patterns are erased entirely, either for a Minimalist effect or to allow for improbable juxtapositions, or with classicism meeting innovation in tribute to the eclectic nature of many of today’s interior decorations. 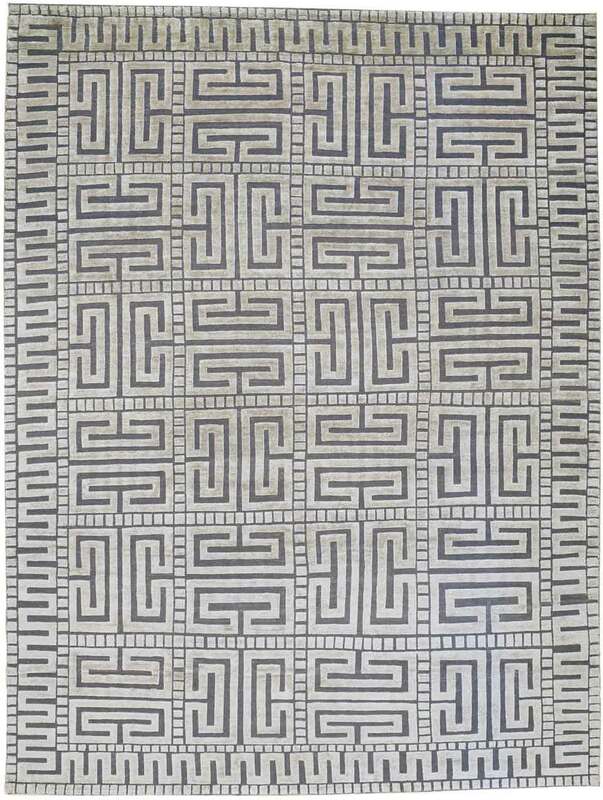 Modern design masters have been interpolated into rug design in endless ways, sometimes with truly outstanding results. 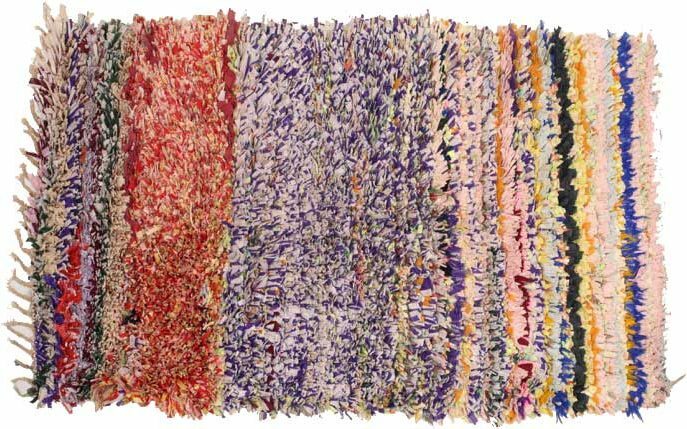 Contemporary artists, ranging from the Hyper-Realists to the Post Avant-Gardists, have also now embraced the woven medium. From my perspective, virtually all of the iconic elements of carpet design have undergone investigation and are now appearing in an endless spectrum of permutations. All this variety has, quite ironically, generated a theoretically consistent inventory of carpets, some of which are marked by a textilic form of ‘shelf life’ – meaning that, while it might satisfy the demand of a trend-hungry clientele, it runs the risk of looking obsolete once the heat is off. I really wish that the Milanese fashionistas would buy carpets at the same frequency with which they shop for clothing. Still, it must be acknowledged that what used to be a purchase intended for a lifetime is now bought with the idea of having it last for but only a decade, perhaps [though not necessarily] more. A carpet must now be timeless yet avant-garde, unpredictable yet easily adaptable to the philosophy of the room. In formulating the recipe for the perfect rug we need not necessarily concentrate our attention on the subject of pattern. In my experience, the buying public does not routinely clamour for innovations in that regard, as they generally find the available options more than sufficient – to the point where anything in excess might even be detrimental and lead to confusion. [See: Modern Carpet Design | Galaincha] Although the general trend has been to move away from traditional patterns, I am finding that the most avant-garde tastemakers are starting to re-embrace the notion of a careful selection of classical designs, with a chosen few even favouring the well-worn motifs we ruggies have been snubbing since time immemorial. What I am witnessing instead is a quasi-obsession with specific palette iterations (think Farrow & Ball’s wide range of greiges) and, even more so, a sensibility towards the intricacies of texture. 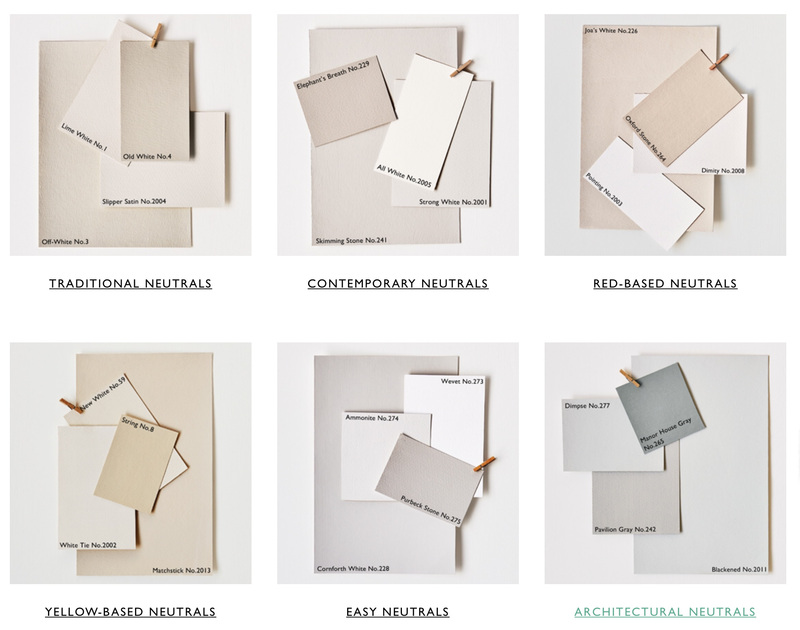 A selection of ‘Grieges’ from Farrow & Ball | Image from Farrow & Ball used under the Fair Use Doctrine. Indeed, it is through the creative use of materials and the way these materials are blended together that we develop the trajectory for the rug industry’s future. I have been noticing in the market an increased attention towards the deceptively simple, mixed-technique textures of Scandinavian weavings, where colour is distributed in subtle gradations and design, often a simple geometric repeat, becomes a pure function of the weaving process. The same applies to Moroccan weavings, ranging from thick-piled Berber rugs to intricately brocaded flatweaves, which offer a panoply of woven fabrics where colours are used either as brushstrokes on an empty canvas or are daringly interspersed within the complex network of wool. There is a lot we can learn from these weaving traditions and perhaps expand upon to create new categories of carpets. Their evocative textures help us emphasize the unique character of a hand-woven product, where each strand is individually hand-plied and inserted in the text with a specific intent in mind. Natural materials such as bamboo and banana silk, nettle, hemp and linen are excellent allies in this respect, in that they can be mixed with wool (and silk) in varying proportions according to the effect one has in mind. Recycled fibres such as sari silk offer a unique colour iridescence that, under a supervised oxidation process, achieve enchanting chromatic results. Even simple cotton can be employed to great advantage when used in conjunction with wool, following the leads of Swedish as well as Indian and Persian weavers (I refer to antique cotton Agras and Dhurries, as well as wool and cotton Tabrizes). There is still much to explore in the domain of synthetic raw materials as well. 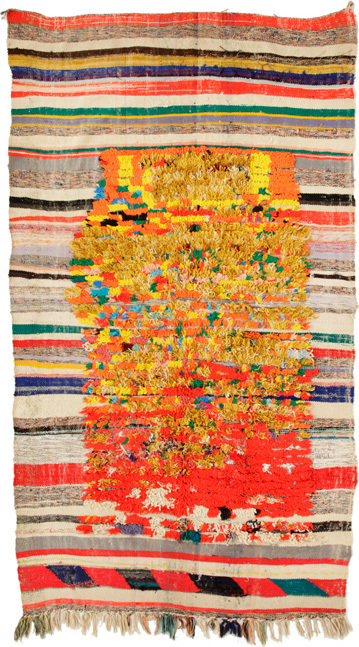 Old tribal weavings are sometimes the most eloquent examples of how one can make the most of what is immediately available, with the Boucherouite rag rugs of Morocco being a recently discovered [by the West] case in point. Encompassing what I feel might be the widest (and wildest) range of patterns one could think of at such low knot densities, the best of these Berber abstractions further distinguish themselves with outlandish juxtapositions of shredded clothing against plastic fibres and Lurex, where different design elements are highlighted by virtue of the diametrically different textures of the materials at hand. Carpet weaving in the 21st century has taken unprecedented leaps forward. The advent of software dedicated to the creation of precise, easily reproducible patterns has revolutionized the market in more than one way. [See again: Modern Carpet Design | Galaincha] While we are all benefitting from these rapidly advancing technologies, we are also witnessing a compromised sensibility towards the actual handcrafted nature of rugs. The demand for weavings available in a short amount of time has led to tufted and semi (if not entirely) mechanically woven carpets representing the bulk of the market. If we truly care for the future of the hand-knotted carpet, then we must take all the necessary steps to restore its true identity. The decorative carpet of the future should bring to light its ancestral component of human craft. Today’s carpet designers would do well to dedicate their efforts towards an intelligent array of new patterns that reference the thread in the needle rather than the pixel on the computer screen. So to answer my own original question, we do need more design but it’s not for design’s sake. Ironically, more design can (and would) play an important role in the conservation of the past. And the very fact that the textile medium has finally broken into the domain of ‘high art’ can serve as incentive for developing a plethora of woven structures. The aim, in my view, is to veer towards true works of design rather than continue to design works.